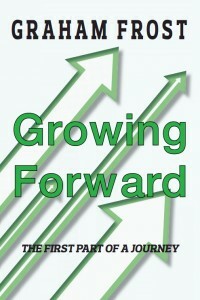 Just finished “Growing Forward” – an amazing and frank account of Graham’s early life. Inspirational and heart warming. I loved that Graham was able to see humour in ever the most dire circumstances. He really painted a picture of life in the 60s and 70s. He writes with great honesty, and compassion. Thank you for a great read! Graham Frost has written a book full of great and remarkable characters – each one of them have some sort of redeeming quality about them. I even liked Graham’s parents – admittedly I don’t understand them but there is something about them that I like. Growing Forward is all about Graham’s life (up to a certain point and yes I am waiting for the next instalment) and as this book is about Graham’s life it is set in “real time” starting in the 50’s. Graham’s ability to describe scenes / people and places so well reminded me of things from my own childhood and teenage years – thank you for that Graham. Graham opens a window to his life for us allowing us to see his strict religious upbringing as he perceived it. How he very calmly walked away from that religion and therefore also his family / how he fell into a life of crime / battled testicular cancer / fell madly in love / found work at British Rail and everything else “in between”. The “in between” parts of this book are just as interesting as the parts already mentioned – the relationships Graham forged with people who “gave him a chance” despite a stay in Borstal / his various yet innocent relationships with several young ladies and ultimately his complicated relationship with Anne who he loved with a passion and she, in return, adored Graham. I feel this book has been written with honesty and humour (I’m not sure if the humour was purposely added however there are passages in the book where I found myself laughing out loud). Graham shows empathy / loyalty and love throughout the book which makes it very easy to read and makes me want to read more. I am looking forward to the next instalment of Graham’s book with eager anticipation. I love / love / love Growing Forward – I can totally understand why Graham’s story has been referred to as inspirational and highly recommend you read it.